Published on Friday, April 12, 2019. This article appears in the April/May 2019 issue of American Craft Magazine. Altered Landscape, 2018, ceramic, underglaze, 10 x 20 x 20 in. It’s the serene figure in the pasture, the wholesome symbol on packages of cheese, the embodiment of sustenance and plenty. For Elliott Kayser, the cow is also a deep well of exploration into culture, place, and the disconnection of modern life from nature. 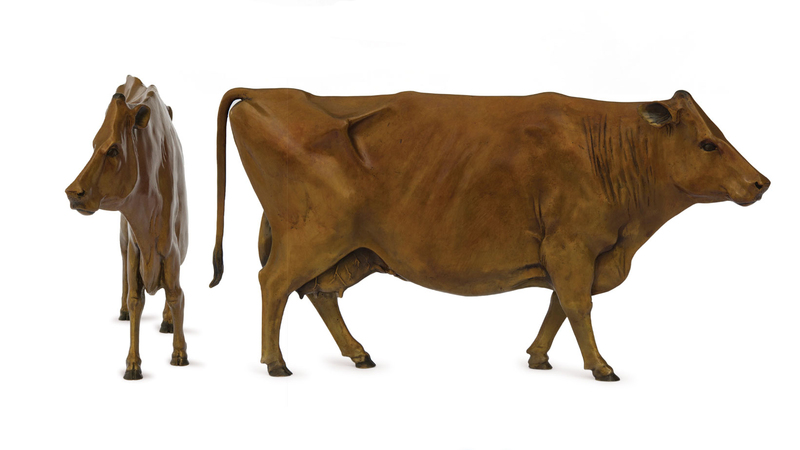 Sculpted in clay and sometimes bronze, Kayser’s scaled-down, anatomically faithful cattle are placed in startling situations. Delilah (2015), a sweet heifer, appears marked up as cuts of beef. (The sculpture emerged from an accident, exploding when Kayser opened the kiln too soon; he reassembled the pieces.) The cows in the Herd Immunity series, started in 2016, are covered in pustules, a metaphor for how we view illness within a population. The tile mural Stock Market (2017) shows livestock in holding pens, awaiting slaughter. The pieces remind us of our primal connection to these animals, even if the reality makes us uncomfortable. Distilled, 2019, bronze, 10 x 25 x 4 in. 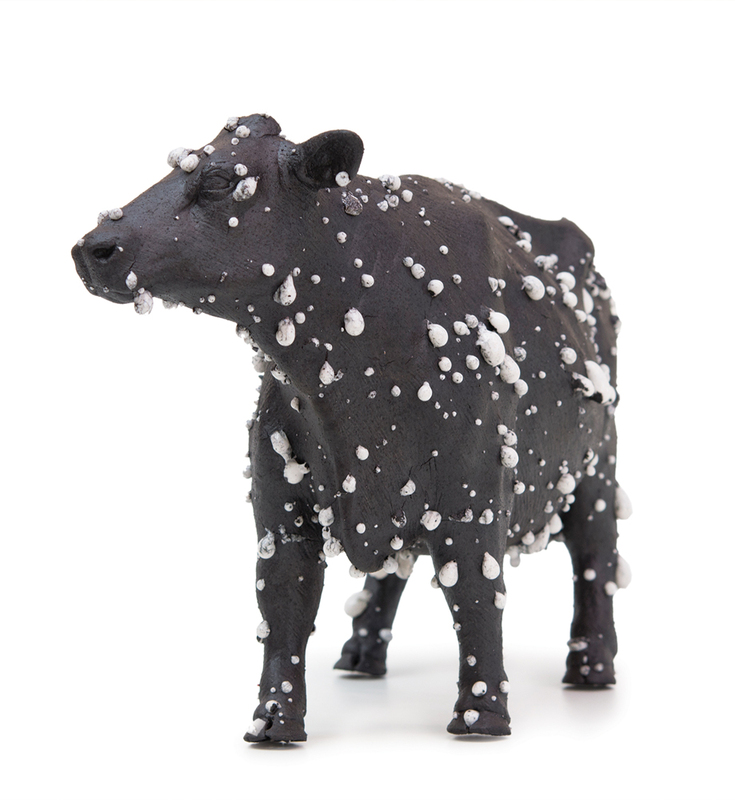 Herd Immunity (Angus), 2017, ceramic, underglaze, feldspathic chips, 7.5 x 12 x 4 in. The cow is Elliott Kayser’s muse. With his sculpture, he aims to spark dialogue about our fraying connection to the land and to the animals we rely on. “I know my work is political, charged. I do have things I’m trying to say with it, but I try not to be preachy and proselytize. I want to find the middle ground, have a dialogue,” Kayser says. “A lot of people don’t understand – am I glorifying the cow as subservient? It’s not about that at all.” Rather, he invites us to consider how, with the advent of industrial farming, we have become detached from the resources we depend on. Born under the earth sign of Taurus in the year of the ox, Kayser is “totally a dirt person,” having worked in clay since he was 10 years old in his hometown of Portland, Oregon. A country boy at heart, he attended the New York State College of Ceramics at Alfred University, where he first started visiting farms and talking to farmers, driven by a desire to reconnect with the land. 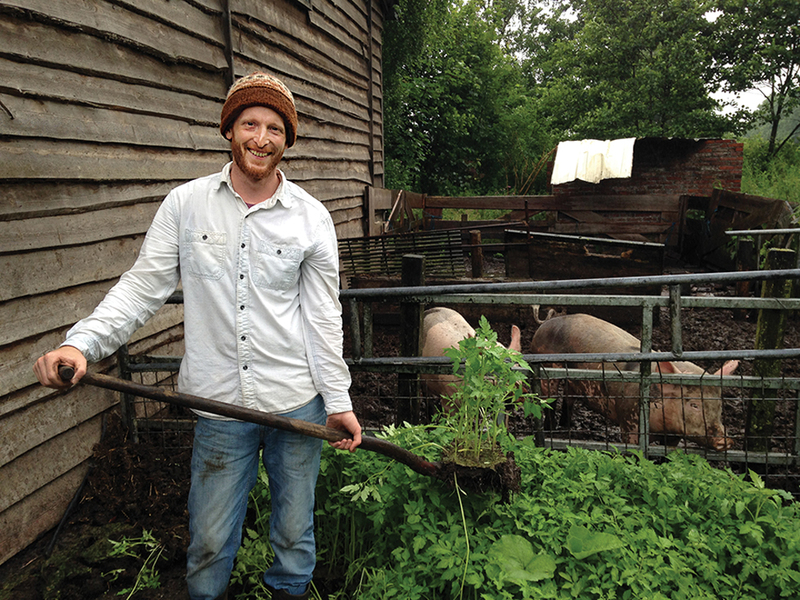 After graduating in 2007, he spent a few years working on farms in exchange for room and board, through the World Wide Opportunities on Organic Farms program. In 2010, ready to get back to clay, he took a job at a tile company in Ann Arbor, Michigan, and later entered the graduate program in ceramics at Arizona State University. There he re searched the role of cattle in American history – the California Gold Rush, the creation of the railroad system, the domestication of the landscape – and realized “the power of the cow as a symbol.” Since earning his MFA in 2017, he’s been a resident artist at the Mesa Arts Center in Arizona, where his wife, Jenneva, is the ceramics studio manager. Kayser’s work is in “Animals Among Us,” to April 28 at Red Lodge Clay Center, Montana. Assembly line: Elliott Kayser sculpts figures out of solid clay on a pipe armature, cuts them apart to make plaster press molds, then uses those to form multiple identical cows, a process he likens to industrial farming. New breed: For a recent public art project, he interpreted a different farm animal, creating eight 300-pound pig sculptures for the Rose Fitzgerald Kennedy Greenway in Boston.